I’ve written before about why and how you can and should embed your social media posts into your home staging blogs, but are you doing it? If you are blogging, doesn’t it make sense to increase your exposure on social media or other blogs by utilizing something you are already doing? Don’t just add hyperlinks, use visualization to increase your followers. Let’s imagine that you are writing about something fabulous and make reference to another staging project, or another subject. Perhaps you are talking about your most recent home staging project and want to discuss the importance of professional photography in maximizing the online appeal. Do you think a link to your past post, or an embedded facebook post would get more clicks? Post by Home Staging & Redesign (SAR) Training. What if you wanted to share tips on how to use photography? Post by Home Star Staging. 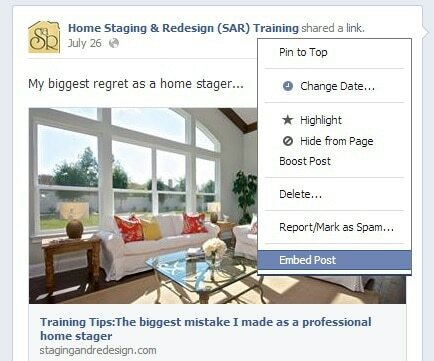 Use your facebook posts to give additional information on individual projects. Here’s what it could look like though…. Post by Stage to Sell | Los Angeles Home Staging. Remember that when people are looking at your home staging blogs, chances are that they are looking for visual references and cues as to what your work is like. We know that people are far more likely to skim over your posts and look at the pictures, bolds and highlights than they are wordy paragraphs. With so many people connecting on mobile devices, capturing easy groupings of photos and links that clearly showcase what they’ll find may be the secret to getting more viewers. Now, how will you start to use a social media embed strategy? « How are you marketing your home staging portfolio?